I just wrote a new password protected post to update the last one I did. Password is the same as last time. 6 months! 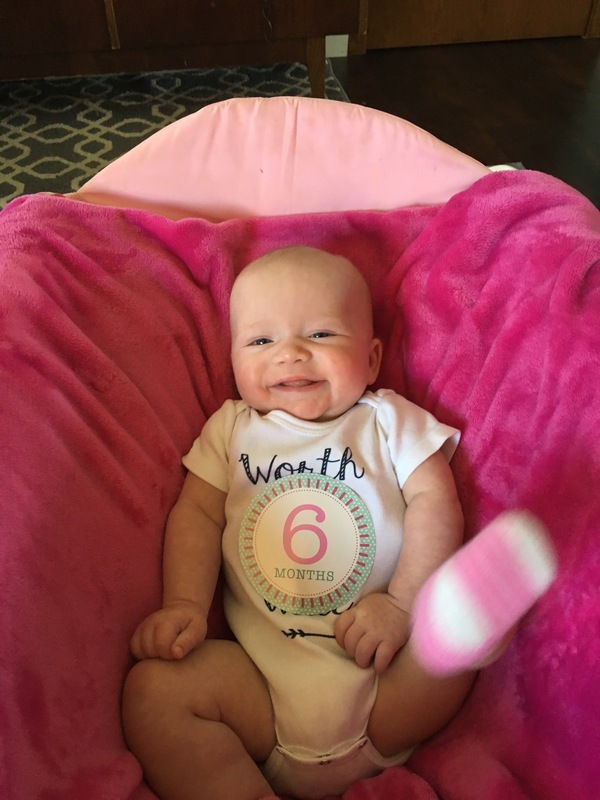 How is that this sweet little girl has been in our lives for 6 months already?! I can hardly remember life befor her. 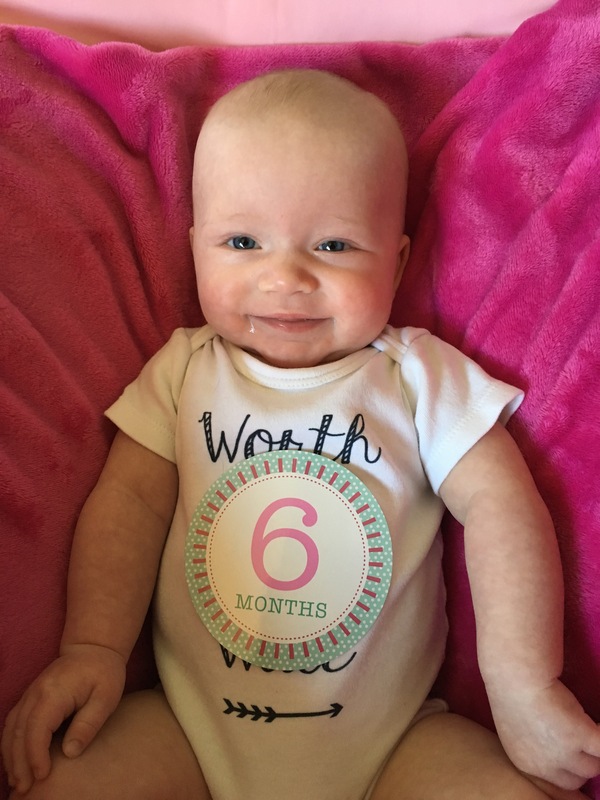 6 months ago this past Tuesday, this precious blessing came into the world and 6 months ago this past Thursday, we met her for the first time and she became our world!!! Weight: 14.4 at her 6 mo appt yesterday! J and I always make a bet going into the appt and he was right on the money this time. I had guessed 14.5 and if she hadn’t pooed right before we weighed her, I probably would’ve been right, lol. Height: 25 inches exactly. J guessed 25 1/4 and I guessed 25 3/4. Her legs just seem so long to me. Medical issues: None really at the moment. Her neck is turning to the left much better now and the pediatrician said she really wouldn’t worry about the right side being slightly flat in back. She was deemed in perfect condition and we were told to keep doing what we’re doing. She does still get constipated once in awhile but we’re always able to solve it with acupressure points, digize oil, pear juice and prunes. Sleep: She’s taking 2 naps a day most days and usually a cat nap at some point in the evening. She’s almost always asleep by 9:30 pm. Our routine is cereal/fruit between 7-8pm, get changed into a new diaper and onsie, drink a couple ounces and then hang out in bed with Daddy chatting and kicking up a storm. After awhile we put her sock monitor on and put her in the magic sleep suit and she’s usually out for the night. She wakes anywhere in between 7-8am usually. Clothing size: 3-6 months in pants. Even the 3 mo pants are too short on her now and 3-6 months in shirts although there is some 0-3 that still fit her in the inside department. Diaper size: she is firmly in size 2 and I’m thinking we may not get through all the boxes we have before she moves up again. Diet: Target up and up infant formula. She’s up to 4 oz at a time every 2-3 hours, sometimes less in the evening. She continues to have rice cereal and fruit around 8 pm with a top off bottle afterwards. I think I’m going to start veggies this weekend. We also gave her peanut butter a couple days before she turned 6 mo. I put a little on her nuk and there was no reaction. The pediatrician said to keep giving it to her 2-3 times/week. 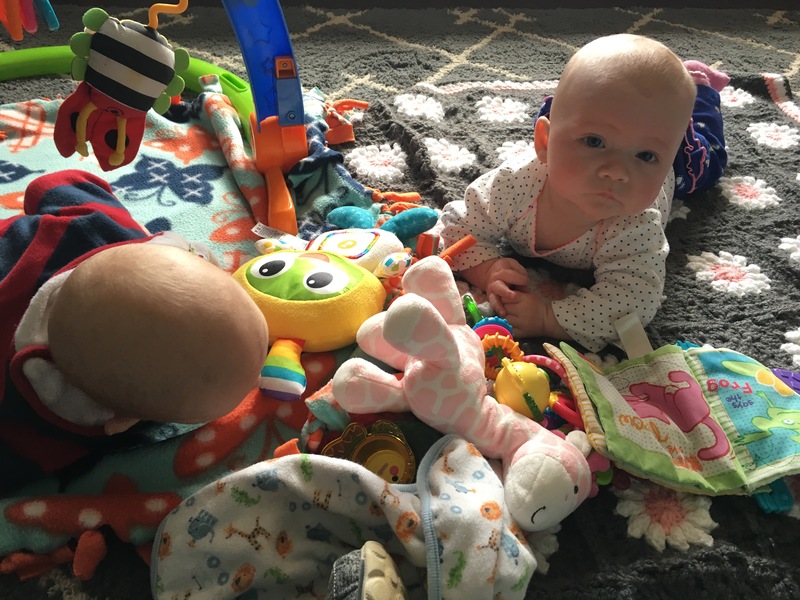 Baby Gear Love: Lillebaby, rock and play and she is a big fan of her piano playmat! She still loves, loves, loves her changing mat. If she’s fussy, set her on there and you’ll get big smiles usually. 🙂 she is back to sleeping in her pack and play. She also loves this little guy my Aunt got her that lights up at the tummy and plays music. She loves her tag blanket too. 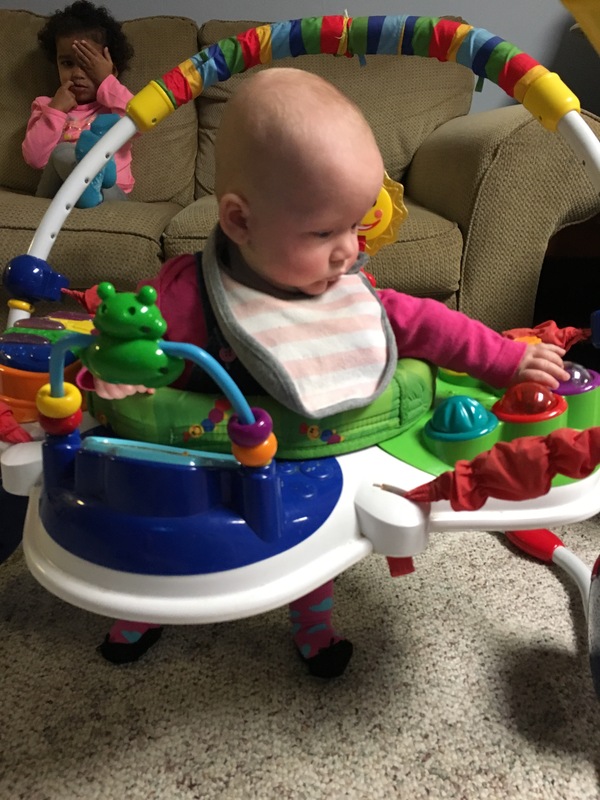 New this month…we started putting her in the jumperoo this past week and she really seems to like it so far. She doesn’t try to jump but it keeps her upright so she can really look around and see what everyone is doing. 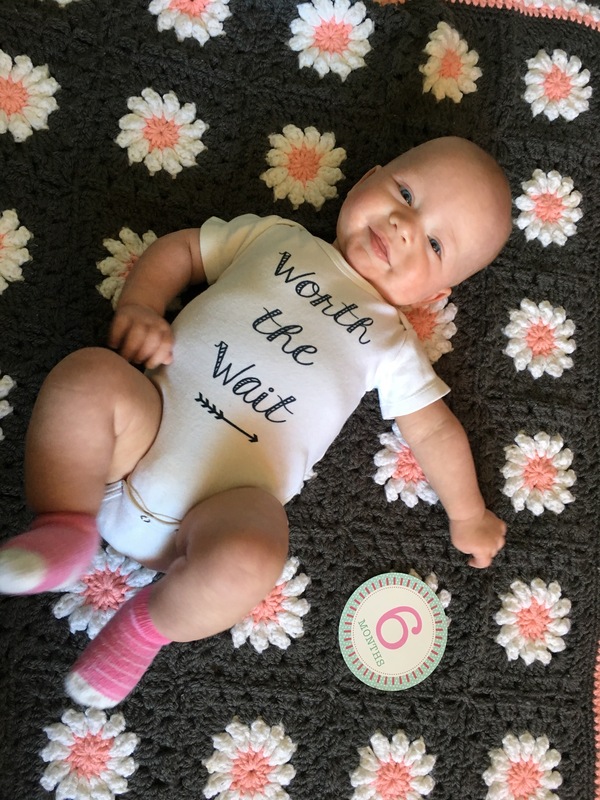 Milestones/Firsts: She is more forthcoming with those laughs of hers now! She stayed on her tummy for close to 30 minutes he other day which is huge for her. She rolled back to tummy…finally, but of course did it when I set her down to clean the kitchen so no one saw it! She still won’t roll a lot, but she can if she wants to. She was also doing downward dog the other day when my Mom was watching her but again, as soon as Mom got the camera, she stopped. Stinker! 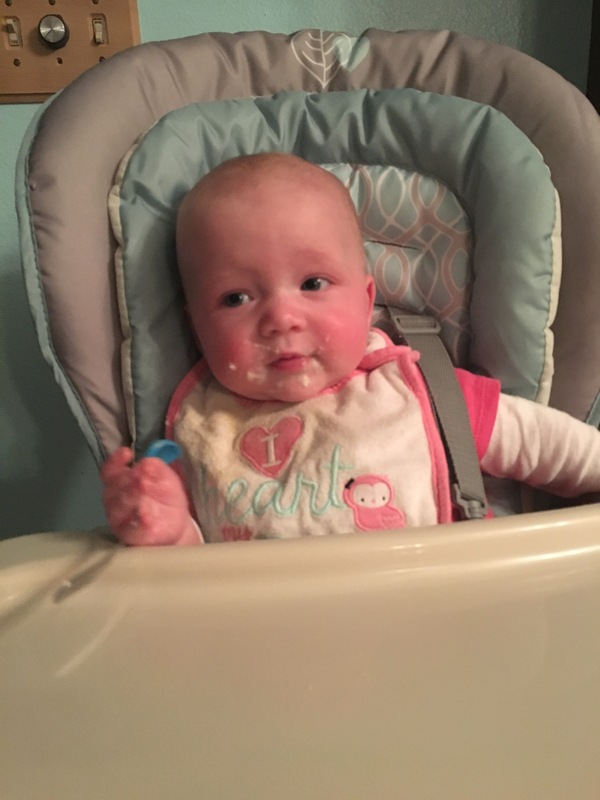 We got her a high chair last weekend and she loves it!!! And it’s so much easier to do that evening cereal now. She also pops herself into sitting position if she’s leaning back in our arms but doesn’t have the core muscles to keep herself upright yet. She can now take out and put her pack back in her mouth. Likes: Baths, playmat, changing mat, food, Mommy and Daddy (she cried when my Mom came over the other day because she knew it meant I was leaving), being told she’s beautiful, peek a boo, her tag blanket (we have one at every station in the house, lol), her paci, her magic sleep suit. Dislikes: Shots but I think we’re done til a year now. When Mommy or Daddy aren’t in eye sight if someone else is holding her. Not being able to see what’s going on. Things I Don’t Want to Forget: Those belly laughs. Her grizzly growls she does with Daddy. Watching her roll for the first time. That smile! Watching her figure something out for the first time. What’s Next? Consistent rolling over I hope. She also loves sitting up and is starting to crunch that core quite a bit so I think she’ll start sitting on her own in the next month or 2. More solids…hope she loves veggies! How’s Mommy doing? I started back at the gym this morning and I have compression socks on the way from Amazon so I can hopefully start running again. I’m going to do the c25k program. My stress level should be going down next Friday for more than one reason which is partly another post. How’s Daddy doing? Hes already in lawn mowing mode and is collecting them in our garage to fix up and sell. Flip or Flop lawn mower style. It’s also March Madness so he’s in his element. We went to Madison last Friday to watch the boys high school state finals and one of our area teams took Division 2 so that was cool. Hey friends…just posted a password protected post. Email me for the password, pdot95@gmail.com. 5 months has come and gone and I’m just updating now. The R household is a very busy place these days. Weight: 12.13 at her NICU follow up on Feb. 3rd which was actually down a couple ounces from her 4 mo appt. She’s 15th percentile and if they do the low birth weight schedule, I believe she was 63rd. Medical Issues: Her follow up appt went well but they did point out that she tilts her head to the right a bit and it is flatter on that side in the back. They referred us to a pediatric physical therapist and we just finally managed to get to that appt this past Friday. She said it’s not off by too much and that she thinks it’ll naturally round back out as she starts to sit up and like tummy time more. We’re supposed to keep her off her back as much as possible which isn’t easy because she loves being on her back and kicking. She said I could start putting her in her bumbo for up to 10 minutes at a time but our chiropractor said absolutely not. My goal is to do more tummy time and maybe use the front pack more then I have been but it’s hard. She also doesn’t like to turn her neck to the left very much so we’re making sure when she is on her back, we put her toys or whatever we’re trying to interest her in to her left. She also came down with her first real cold/cough a week ago and it was awful!!! I cried right along with her. She’s still a bit snotty and coughs a bit still but she’s 95% better from where she was…Thank God!!! Sleep: She’s taking 2 naps a day most days and usually a cat nap at some point in the evening. She’s almost always asleep by 9:30 pm. Our routine is cereal/fruit between 7-8pm, get changed into a new diaper and onsie, drink a couple ounces and then hang out in bed with Daddy chatting and kicking up a storm. After awhile we put her sock monitor on and put her in the magic sleep suit and she’s usually out for the night. The last week she’s been waking up at about 6am with a coughing fit but now that it’s mostly over, we’ll see what this week brings. Clothing Size: 3-6 Months in most things. Still have a couple 0-3 things out but not much at all. I hit up the dollar sale at our local kid’s boutique consignment store and she’s set for summer now! Diaper Size: Size 1 still. Trying to decide if we can make it through the last big box before she moves up to 2’s or if I should return them. I’ll probably open up a smaller pack of 2’s to see how they fit her before I decide. Diet: Up and Up Infant formula usually 3 oz bottles and rice cereal and fruit at night. So far we’ve tried banana, applesauce, prunes, pears and peaches and she’s done well with all of them. She has bottles anywhere between between 2 1/2-3 hours during the day with a long stretch without one during her afternoon nap and then closer to 2 hrs between them in the evening. Same as last month. 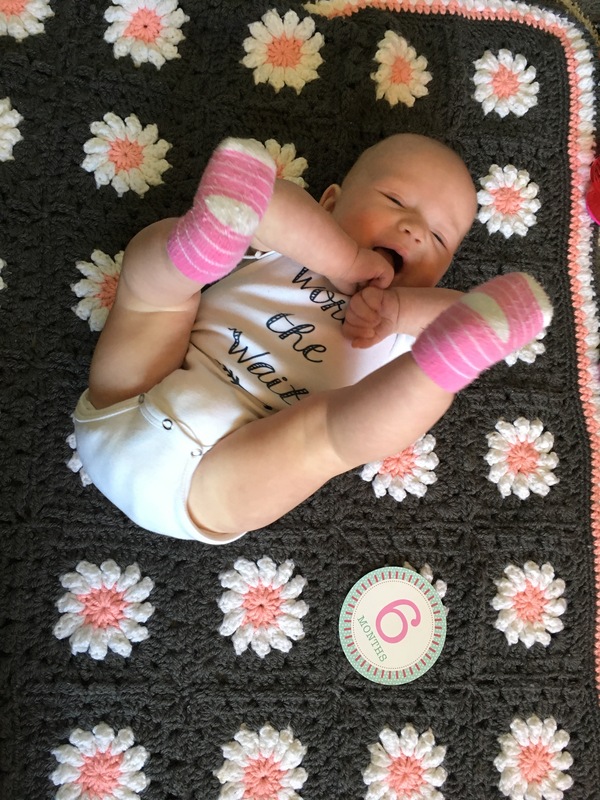 Baby Gear Love: Lillebaby, rock and play and she is a big fan of her piano playmat! She still loves, loves, loves her changing mat. If she’s fussy, set her on there and you’ll get big smiles usually. Nothing new here. She was starting to sleep in her pack and play at night instead of the rock and play but then she got sick and we wanted her inclined. She also loves this little guy my Aunt got her that lights up at the tummy and plays music. She loves her tag blanket too. Milestones/Firsts: She is belly laughing now but is pretty stingy about them. She also finally will do tummy time for about 5 minutes before getting angry and pushes up from her fore arms. She turns herself when she’s on her back. Teething!!! Her front bottom teeth aren’t popping through but I’m pretty sure they’re on their way. She constantly chews on her fist and soaks through her bibs and clothes. Her cheeks get red sometimes and she can get fussy at time. Diluted thieves on her gums takes care of that though! Dislikes: Tummy time…it’s getting better, but still not her favorite. She is starting to cry sometimes if we’re in sight but someone else is holding her. Her carseat sometimes. More often than not, she wants to be put into her magic sleep suit and put down to go to sleep vs being rocked/cuddled. Starting to get overwhelmed with too much noise/people. Things I Don’t Want to Forget: Those belly laughs. Seeing her finally push her head/chest up during tummy time. Her grizzly growls she does with Daddy. What’s Next? Consistent rolling over I hope. She also loves sitting up and is starting to crunch that core quite a bit so I think she’ll start sitting on her own in the next month or 2. How’s Mommy doing? Mommy’s turning 40 yrs old tomorrow and is so grateful that my biggest wish came true before this big milestone (another post on that later). I love watching her grow and learn but also wish she was back to that 5lb, snuggly tiny baby sometimes because I miss just rocking and snuggling her. How’s Daddy doing? He’s finally done coaching for this school year and is loving being home right after school. I think A is equally a Mommy and Daddy’s girl but they have their own little routine together and that I love watching. The first night that she was really sick, the owlet stopped working which had me freaked out. I woke up at 3am to see J had moved his pillow to the end up of the bed so his head was right by her pack and play and I fell in love with him all over again. He is such a good Daddy! Not hating tummy time for once! Actual 5 month Birthday. Mommy got super sick mid morning so the photo shoot was the day after! A rare snuggly sleepy baby time. Let’s be real…sometimes, this is what my house looks like…especially when I have a sick baby! Finally starting to feel better!